Botox became a common household term in recent years and is one of the most popular cosmetic services. It works. It is safe. It is predictable and provides noticeable results with virtually no downtime. Basic Botox treatment hides facial wrinkles created by repeated movement. 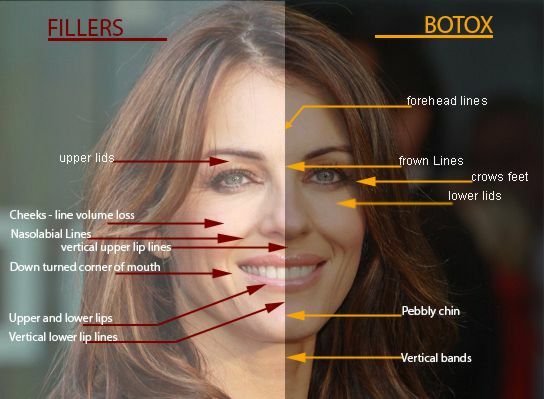 Advanced use of Botox affords shaping of facial features. If performed conservatively, your family and friends will appreciate that you look more relaxed and younger, but they will not be able to figure out how you did it. While Botox is a brand name, it has become the widely used general abbreviation for neuromodulators. I will use the name Botox for reasons of simplicity to include all neuromodulators. We do not employ injectors! Service is performed only by our dermatologists. Find out the complete price list for all cosmetic services. The most common areas for wrinkle relaxation are the frown lines between the brows, crow’s feet on the outside of the eyes, wrinkles on the forehead, and vertical lines above and below the lips where lip stick may bleed. In addition to wrinkle relaxation, advanced use of Botox allows shaping of brows and lifting of brows and eyelids. We can up-turn corners of the mouth and soften a puckered chin. We can also reduce prominent vertical bands in the upper neck, minimize a gummy smile, and turn a square face into a more triangular one. Unlike filler placement to areas of the face where aging causes loss of volume of the skin and underlying fat and bony structures, Botox targets facial wrinkles that are created by dynamic movement. As we age, loss of skin elasticity allows repetitive muscle movement to create a visible crease in the skin. Botox weakens this muscle movement and prevents the line from forming. Many times, it even reverses wrinkles that have already settled. Let’s take the eyes, for example. With every smile, our body releases endorphins that keep us happy. It would be unhealthy not to smile anymore. 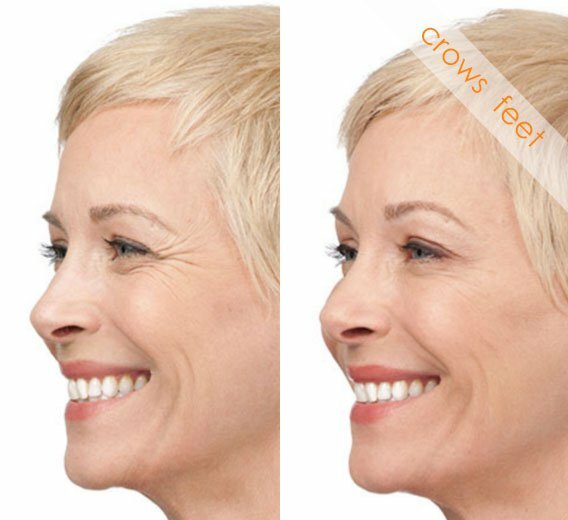 But with the help of Botox, we can have a guilt-free smile without fear that we are deepening the dreaded crow’s feet. On the other hand, we can untrain the forehead muscle and those between the brows to no longer look constantly strained or angry. Botox works best to prevent wrinkles. Once wrinkles are visible at rest, it will take some time until the skin returns to its original shape. Deep static lines may need help from a filler if they have not resolved after 3 Botox injections performed 4-6 months apart. 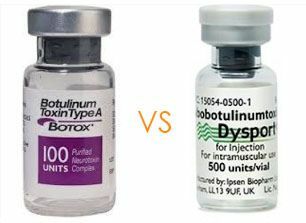 Botox brand was the first neuromodulator approved for cosmetic use in the United States and it is the only one currently approved for medical diagnoses in this country. Dysport and Xeomin are equivalent neuromodulators that have since been approved by the FDA for wrinkle reduction on the upper face. Dysport differs from Botox brand by a slightly smaller molecule size and therefore slightly wider spread. Xeomin is almost identical to Botox brand, but it is bit more pure, which reduces the risk of tolerance formation. Cosmetic Botox has an excellent safety profile. You should not receive Botox during pregnancy or while nursing a baby. It is contraindicated in anyone with a neuromuscular disorders or a first degree relative with a neuromuscular disorder. You should not receive Botox when you are sick. In addition to this, Dysport should be avoided with a cow milk allergy. Learn how Botox can be strategically placed to address specific areas on your face that bother you. Starting on the forehead, frequent raising of the brows as part of our facial expression when we are younger can eventually lead to horizontal forehead lines. Botox distributed in small aliquots equally across this flat sheet muscle will relax these lines and will help you unlearn to subconsciously use this muscle. In people who have a predisposition to developing a Spock eyebrow, Botox may have to be placed here (lateral lower forehead) at the time of first injection or with a delay of 14 days. As we get older, we may crunch forehead lines because we use the forehead muscle to take weight off of the eyelids. In this case, Botox to the forehead muscle is not the right treatment. Instead we would consider a chemical brow or lid lift by placing Botox here (corrugators) and here (tail of brow). If laxity is too pronounced for Botox to make a difference, surgical lid and/or brow lift should be considered. Moving to the glabella, the interaction between a bellied vertical muscle (point to the procerus) and 2 fan-shaped muscles that trail upward and outward (point to corrugators) creates one or two vertical lines that make us look angry. Placement of Botox to 3 or 5 different points in this area (pointing to the V created by these muscles) allows us to look relaxed again. Smiling and squinting creates lines on the sides of the eyes. These are more pronounced on the outside of the eyes (point to lateral canthal lines) than on the side of the nose (point to medial canthal lines). If skin has had a lot of sun exposure or if sun glasses were not routinely worn, these lines are often more accentuated. When fine lines occur just below the eyes or in those with a muscular ridge beneath the eye known as a “jelly roll,” a small amount of Botox (point to mid pupillary line) can make quite a difference as long as the muscle shows perfect contraction before start of treatment. Botox can shape brows. While women often seek arched brows, men typically prefer linear brows. Botox administered to the glabella (point to glabella), the lateral brow, and the upper lid (point to both) will create the desired look. 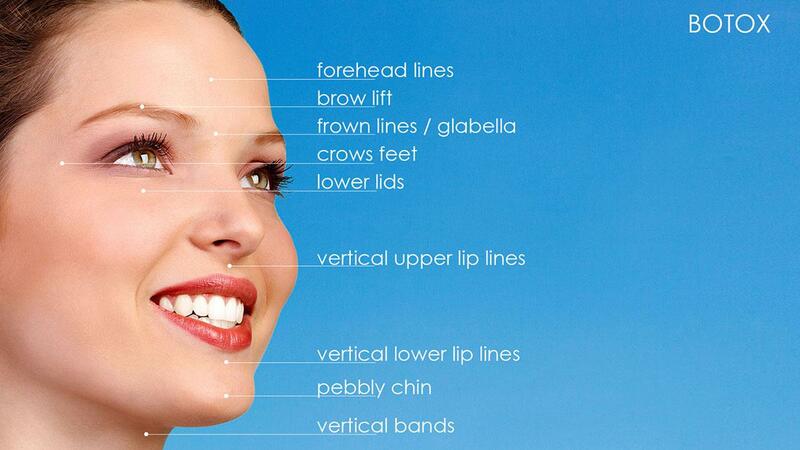 While Botox is predominantly used on the upper face, there are focal targets on the lower face. Botox to the upper cutaneous lip (point to it) can reduce vertical upper and lower lip lines (make an O) created by sun exposure, smoking, or with genetic predisposition. Botox placed here (point to below nostrils) will lower the cutaneous lip to conceal the gums when your smile reveals them. The corners of the mouth are important to our perception by others. If they are downturned, we signal sadness, discontent, or aging. These corners are elevated by this muscle (point to levator angularis oris) and pulled down by this one (point to depressor angularis oris). Weakening the muscle that pulls these down (point to DOA) allows the muscle that holds the corners of the mouth up (point to LOA) to gain the upper hand. When volume loss is present in the triangle below the corners of the mouth (point to marionette through), a soft hyaluronic acid filler will achieve a similar upturn. A strong mentalis muscle can result in puckering of the chin (point to chin) when the lips are closed at rest. A small amount of Botox assures that the muscle is smooth, but does not become fleeting. These vertical lines that are visible in our forties in thin people and with genetic predisposition (point to them) are called platysmal bands. Botox can achieve enough relaxation of platysmal bands to be noticeable in more than 50% of those who are treated. In others, the relaxation might not create a significant difference. Yet, it is worth a trial. Women from the Northern Far East like Japan, Korea, and China often desire to minimize a squared contour of the lower face (point to lower face). Botox can weaken our bite or masseter muscle (point to masseter) enough to render a more oval contour here. In general, men have stronger and bigger bellied muscles than women and therefore require larger amounts of Botox. Botox lasts about 4-6 months in stronger bellied muscles such as in between the brows, in the chin, and in the masseter. It wears off after 2-4 months in thinner muscles such as around the eyes and in the forehead. Botox should wear off before the next round is administered to prevent the muscle from weakening completely and permanently. Please carefully consider the professional who places your Botox. While Botox parties have vanished for the most part, almost everyone offers Botox, from your hair salon or Yoga studio to your gynecologist, emergency room physician, and dentist. You can have your weekend-trained gynecologist eradicate the furrows between your brows, but unless Botox is all he or she performs, this gynecologist will probably not know the fine points that relate to brow position and minimizing preexisting asymmetries. I recommend that you trust those who have studied muscles of facial expression in detail, namely your dermatologist or plastic surgeon.